The luteal phase is the time between ovulation and the next menstrual period, while the follicular phase precedes the luteal phase and is the time between the first day of the menstrual period and ovulation. The length of the follicular phase can normally last between 7 and 21 days, but the luteal phase needs to last a minimum of 12 days to ensure that the fertilized egg has enough time for implantation. We will calculate for you the expected date of ovulation and when to best make love. Having a normal luteal phase is essential for your fertility. A luteal phase less than 12 days is not normal, it may be associated with a deficit in progesterone production and it is also known as "luteal phase deficiency". The luteal phase is the part of the menstrual cycle which begins immediately after ovulation. 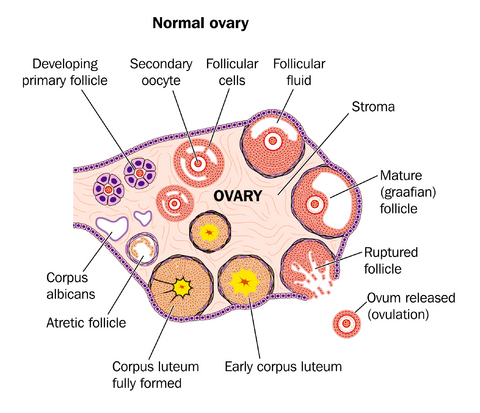 There are two phases in the menstrual cycle, the first part is the follicular phase which begins on the first day of the menstrual bleeding or period, and the second phase is the luteal phase which begins at ovulation and ends when the next menstrual bleeding begins, or with pregnancy. The luteal phase begins with the formation of the corpus luteum after ovulation and ends in either pregnancy or luteolysis (the structural and functional degeneration of the corpus luteum). The main hormone associated with this stage is progesterone, which is significantly higher during the luteal phase than other phases of the cycle. Your menstrual cycle begins on the first day of your menstrual period, day one, which is the first day when you start bleeding. The menstrual cycle ends the day before your next menstrual bleeding begins. In most women, the menstrual cycle lasts between 21 and 35 days. Follicular Phase: This phase starts on the first day of your menstrual period, the day your bleeding or period begins (known as cycle day one or CD1), and lasts until ovulation. Luteal Phase: This phase begins on the day that ovulation occurs and continues until the day before your next menstrual bleeding, which indicates the start of your next period.